Eliza Bennet has the life she's always dreamed of. She's who she wants to be, and she's with the man she loves. But Eliza is living a lie. Her real name is Klaudia Myer. And Klaudia is on the run. She's escaping her old life, and a terrible secret buried at the heart of her family. This is the story of Eliza and Klaudia. One woman. Two lives. And a lie they cannot hide from. I have written a full review of The Other Me by Saskia Sarginson, you can find it here. Arthur Pepper gets up every day at 7.30am. He eats his breakfast, waters his plant, Frederica, and does not speak to anyone unless it is absolutely necessary. Until something disrupts his routine. On the first anniversary of his beloved wife Miriam's death, he finally sorts through her wardrobe and finds a glistening gold charm bracelet that he has never seen before. Upon examination, Arthur finds a telephone number on the underside of a gold elephant. Uncharacteristically, he picks up the phone. And so begins Arthur's quest - charm by charm, from York to Paris to India - as he seeks to uncover Miriam's secret life before they were married. And along the way, find out more about himself. This book is as whimsical as the title sounds! Telling the story of Arthur Pepper, a man who has been living a life of routine since the death of his dear wife, breaks from routine and begins an adventure in the hopes of learning more about his deceased wife... Learning about a life she kept from him their entire marriage. Arthur Pepper is endearing, the plot thought provoking, and the ending will be sure to leave you with a smile. I have written a full review of The Weight of Silence by Heather Gudenkauf, you can find it here. So true - I feel like I'm discovering new to me books and authors on a daily basis! I suppose that largely comes with book blogging though. I need to go read your reviews. I really enjoyed The Weight of Silence, I want to say my favourite by her so far. I'm with you on that! I have read three of her books now, and The Weight of Silence is my favourite so far. I still have a few to discover though so we'll see if that remains. Oh, I get what you mean. I feel like I'm fairly good at separating the two... I have empathy for those involved, I can put myself in their shoes, but I don't put my life in their shoes... If that makes sense! There have been certain family oriented books wherever I've gone through the 'what would I do' dilemma, but for the most part I can keep fiction and real life separate. I hope that makes sense. Haha!! Arthur Pepper sounds absolutely wonderful! I'm on the fence about The Weight of Silence. I really want to read something by the author but I don't deal well with books about kids. I read a thriller from J.T. Ellison called Field of Graves that stands out the most. It seriously kept me up turning pages! 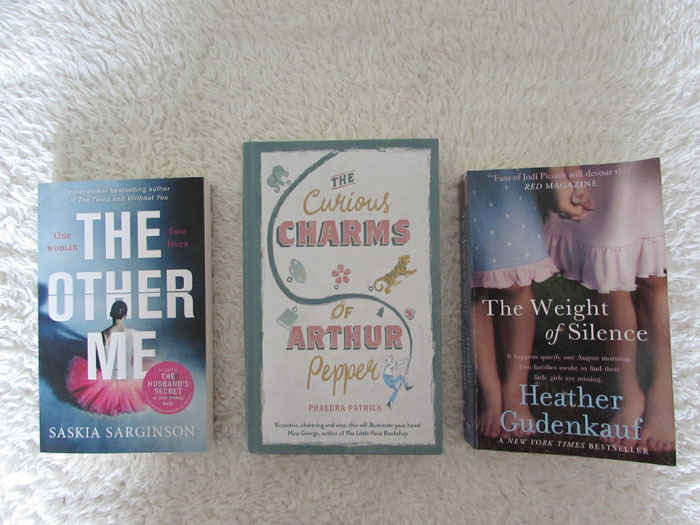 The Curious Charms of Arthur Pepper was such a great read - I didn't expect to enjoy it as much as I did. Ah, a bit of conflict there regarding Heather Gudenkauf. Even if you don't discover her work through The Weight of Silence, I think her writing is well worth experiencing. They're the kind of stories where you put yourself in the characters shoes, and represent reality in many ways, not only that but Heather's writing style is very authentic to real life and well detailed but not overly descriptive (my preferred type). Arthur Pepper looks really fun. I love the cover! The cover is what attracted me to the book!